The large Russian landing ships sailed Minsk and Novocherkassk Tuesday toward the Mediterranean Sea, announced the country's Defense Ministry. The Russian amphibious assault ships "come to the assigned area 5 or Sept. 6 after passing through the narrow [in reference to the Bosphorus and the Dardanelles] and perform their duties under the plan for the operational command located aboard the anti-submarine ship Admiral Panteleyev "the ministry said, quoted by the Russian news agency Itar-Tass . "The Russian Navy continues its rotation plan and auxiliary warships operating in the group is responsible for maintaining permanent naval presence in the Mediterranean," the source said. Also, the survey vessel Priazovie , the Russian Black Sea Fleet, set sail Sunday from the base of Sevastopol (Ukraine) to the coast of Syria to collect information on the escalation of the armed conflict in the Arab country. 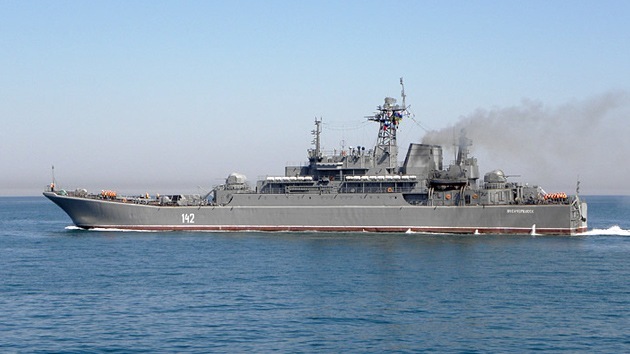 Although some representatives of the Russian Navy have stated that sending ships in the Mediterranean not linked to the Syrian crisis , other media said the deployment is related to the escalation of tension in that area.
" Due to the known situation in the Middle East make some modifications to the naval forces in the region, "said a source in the headquarters of Russia told Interfax. Regarding this matter, the head of the U.S. Joint Chiefs, Gen. Martin Dempsey, said Tuesday that the U.S. not believe that the Russian ships will respond if it is carried out an attack against Syria. "Now there are four Russian warships in the eastern Mediterranean," said Dempsey. "They are at a respectful distance [of Syria]," he added.